Mobile users across the country would soon see yet another series of mobile numbers, possibly as early as February 2010. While the Department Of Telecommunication (DoT) has issued all almost all numbers starting with ‘9′ and ‘8′, the new numbers would start with ‘7′. You may recall that TELECOM TALK was the 1st to announce ‘8′ series mobile numbers (MOBILE NOS STARTING WITH ‘8?, SOON) on 15 August 2009, which was introduced less than a month later on 9 September 2009 – MOBILE NUMBERS STARTING WITH “8? LAUNCHED! All ‘9x’ levels ranging from 90 / 91 / 95 / 96 / 97 / 98 / 99 have been allotted to various operators (and levels 92 / 93 / 94 reserved for Tata Indicom/ Reliance Mobile/BSNL respectively) while among the ‘8x’ levels only some series (80/81/88/89) could be alotted to mobile operators due to several series already being in use for STD codes. So those of you crazy about numbers, especially the significant ‘786′ series, get ready to select your special number! 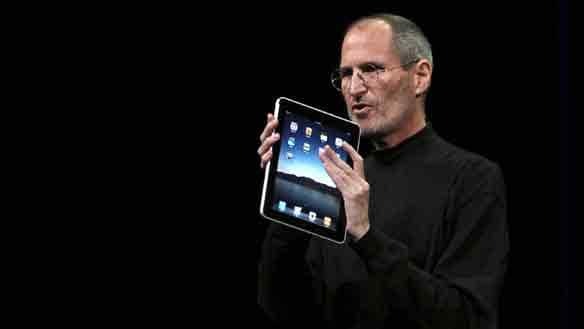 Apple CEO Steve Jobs has unveiled the iPad, a tablet-style computer that resembles the iPhone,but larger. "It's so much more intimate than a laptop and so much more capable than a smart phone," Jobs said on Wednesday at the device's highly anticipated debut in San Francisco. Dressed in his trademark blue jeans and black turtleneck, Jobs demonstrated some of the features of the iPad, which he said include browsing the Internet, playing games, listening to music and watching high-definition video. "We've got movies, videos, TV shows," Jobs said. Jobs also showed off the virtual keyboard on the machine and said the iTunes music store is built into the iPad. The iPad is half an inch thick (1.3-cm) and weighs 1.5 pounds (0.7 kilograms), he said, and will come with 16- 32- or 64-gigabytes of flash memory. "We have been able to achieve 10 hours of battery life," he said. "I can take a flight from San Francisco to Tokyo and watch video the whole way on one charge." Shares in Apple fell $4.65, or 2.3 percent, to $201.29 in afternoon trading on Wednesday. The Cupertino, Calif.-based company's shares have more than doubled over the past year, partly on anticipation of the tablet computer. It may not have popped up in your birthdays list, but today is orkut's big day: the site is now 6 years old! In the past 6 years we've learned to walk, talk, and color inside the lines, among many other achievements. We've even shaken things up and reinvented ourselves not once but twice! More importantly, we've made a ton of great friends along the way (over 80 million worldwide), and are happy to include you among them. A chewing-gum sized Chinese device known as “dual SIM card holder” is now available in the market, priced as low as Rs 50 to Rs 200, which can be placed under the battery of your mobile phone and that has a provision to hold another SIM card, which can be activated whenever there is a need to call. You don’t need to carry two mobile phones, one to receive calls and the other to make calls, or buy a new Dual-SIM phone. This small device can be used in most of the low-to-middle-end models. So, you can retain your current number for many years and subscribe to a new operator and a better plan. No need to worry about mobile number portability being delayed in India! Once installed, you an simply use the new Dual SIM/AUTH option in your phones menu to swap between SIM cards with a simple menu press. Modern phones use SAT (SIM Application Toolkit) functionality to allow them to use extra functionality built into newer SIM cards. The card holdedrs use this to enable a new Dual Card/Auth option on your phone. Most of these card holders work just like swapping SIM cards manually. Any information saved on the SIM is automatically retained. Your text messages and phone numbers are saved automatically to the SIM card they belong to. Any information stored on your phone is also saved, no need to loose any data. Make sure there is enough space between casing and/or battery to place the other SIM card. One SIM card is inserted in the SIM card slot of your mobile phone and the other can be folded to be held between your back casing and the battery, but you need to make sure such space is enough for the SIM to fit there. If your phone is too slim, you might not be able to fit the SIM. According to industry estimates, 20% of the existing mobile user base is using more than one SIM.